If you want to take complete backup of your particular website then our backup manager module enables you to do this including all the databases belonging to it. In the Files section click on Backup wizard. Once Backup Wizard module is selected, you will be able to see the Backup button on the bottom, click on it. 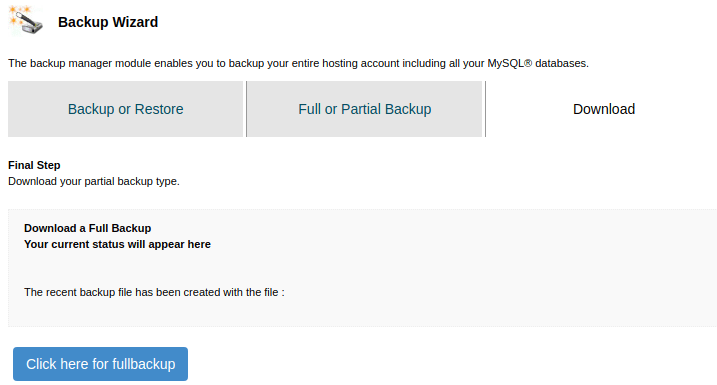 Next click on Full Backup , Finally select click here for full backup, now it will starts taking the full backup of your website. Your Backup Data will be found under Backups Folder, Kindly use File Manager Module to download those data’s.